Marie Porter’s latest cookbook More Than Poutine: Favourite Foods from My Home and Native Land resonated with me in many ways. Obviously it’s all about food but it’s Canadian recipes written by a fellow expat. When I made the move to the UK, first London then Cambridge, I was delighted to meet so many fellow Canadians in the same boat as me. We all miss our favourite foods, the ones we grew up on, that gave us joy and shared with loved ones. The cookbook features a lot of comfort foods, which is a nice reflection of these feelings of nostalgia. The book’s title really hits the nail on the head. 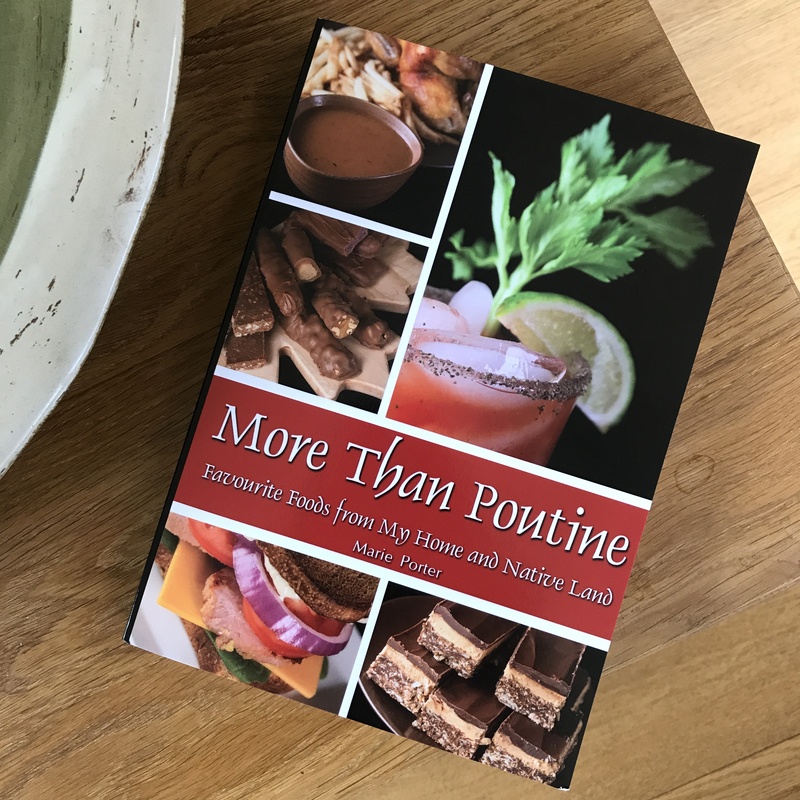 Poutine may be the Canadian specialty that first springs to mind but the cookbook is very well researched and spans over 120 recipes from all over Canada. Rest assured there is a great poutine recipe, complete with homemade gravy. The book also includes other well-known Canadian foods such as butter tarts, Nanaimo bars, tourtière and lobster rolls. The recipes begin with a few explanatory words, as Canada is so diverse not all Canadians might know the dishes. The cookbook isn’t only for expats though, there’s enough interesting information for those living in Canada who want to expand their Canadian cooking repertoire. It’s also a great introduction to Canadian cuisine for anyone eager to learn more about Canada’s unique and varied culture. The recipes’ measurements are provided in both US and metric units, with a more detailed conversions section at the end of the book. It’s also worth noting that there is a focus on providing gluten-free alternatives to the recipes so the book is a good resource for those avoiding gluten. With recipes classed into the following categories: Breakfast & Brunch, Appetizers & Sides, Snack Foods, Main Dishes, Jiggs Dinner (Sunday Dinner in Newfoundland), Beverages & Condiments and Desserts, the cookbook covers a lot of territory, both in the geographic and culinary sense. All of my favourites are in the book: Bannock, Montreal Style Bagels, Montreal Smoked Meat, Maple Snow Taffy, French Canadian Pea Soup and Bloody Caesar (Bloody Mary’s Canadian cousin). There are even accurate replicas of Jos Louis cake rounds, Oh Henry! chocolate bars and Swiss Chalet/St-Hubert BBQ sauce, although for trademarks reasons the recipe names had to be changed. It’s fun figuring out the inspiration behind the creative titles. The recipes relating to cultures and traditions from other parts of Canada were a real eye-opener for me. 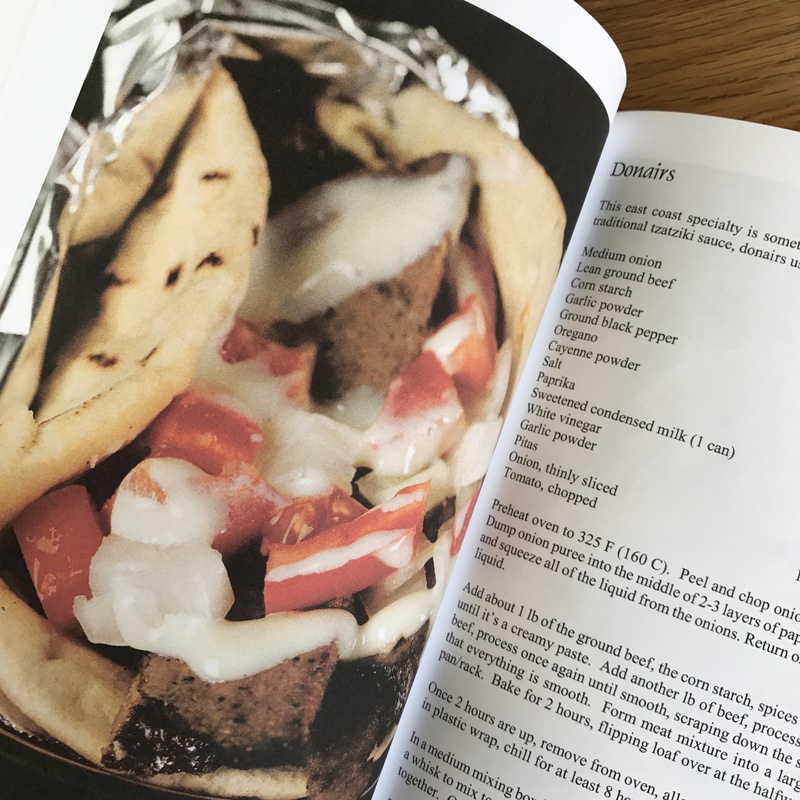 It’s also wonderful that Canada is acknowledged as being a cultural mosaic so the cookbook includes recipes for perogies and souvlaki, for example. I think spaghetti & meatballs should have been included too as this dish originated with Italian immigrants. 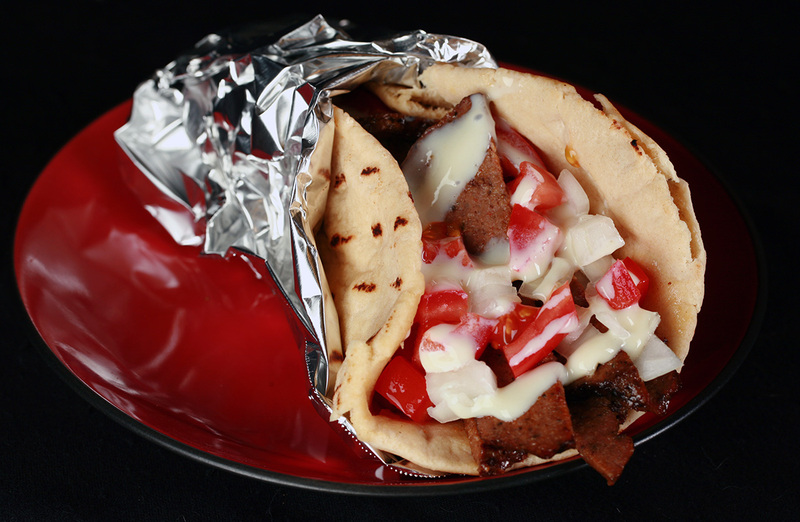 The Donair recipe piqued my interest as I first tried this east coast specialty on a trip to Nova Scotia back in 1997. It’s even been declared as the official food of Halifax. It’s not quite the same as what we know as the “doner kebab” in the UK. 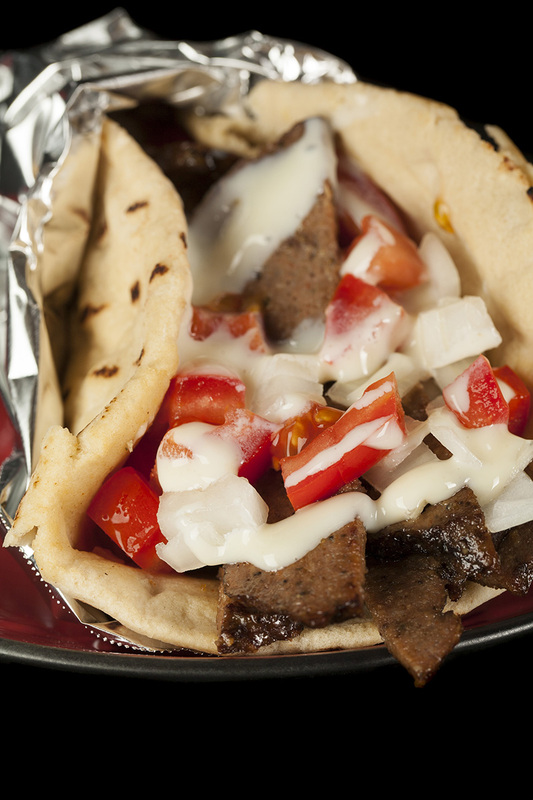 Donairs are made with beef – not lamb – and the sauce is very specific to Maritime tastes. It’s made with sweetened condensed milk so it’s sweet, not sour like yogurt-based sauces. Photo credit: Michael Porter, M. Porter Photography/Celebration Generation, All Rights Reserved. Marie Porter has kindly given me permission to share the Donairs recipe from More Than Poutine. Don’t be put off by the number of ingredients, they’re mostly the delicious spices needed to flavour the beef. It is a little time consuming to cook the meat then waiting for it to cool and chill, but it’s worth it. It’s a healthier option that a greasy take-away. And if beef isn’t your thing, you can find a vegetarian/vegan version of the recipe on Marie’s website Celebration Generation: Vegetarian Donairs / Vegan Donair Meat. Preheat oven to 325 F (160 C). Peel and chop onion, pulse in a food processor until pureed. Dump onion puree into the middle of 2-3 layers of paper towels or cheesecloth; gather the edges and squeeze all of the liquid from the onions. Return the onion solids to the food processor, discard liquid. Add about 1 lb of the ground beef, the corn starch, spices and salt to the food processor, process until it’s a creamy paste. Add another lb of beef, process again until smooth. Add remaining beef, process once again until smooth, scraping down the sides of the food processor to ensure that everything is smooth. Form meat mixture into a large log shape, place onto a broiling pan/rack (Note: the broiling pan/rack is known as a grilling tray in the UK. It’s the tray that comes with the oven). Bake for 2 hours, flipping loaf over at the halfway point. Once 2 hours are up, remove from oven, allow to cool to room temperature. Wrap cooled loaf in plastic wrap, chill for at least 8 hours, or overnight. In a medium mixing bowl, combine sweetened condensed milk, vinegar, and garlic powder. Use a whisk to mix together the sauce ingredients – it’ll take some time, but it will eventually come together. Once well combined and thick, transfer to a covered container, chill until use. To Assemble: Brush pitas with a little water, heat in a hot frying pan until warmed through. Heat a little vegetable oil in a frying pan. Slice donair meat into 1/4″ thick slices, add to pan and reheat until desired texture (If you like crispy edges, cook a little longer than you would if you don’t!). Pile reheated meat on warm pita, drizzle generously with sauce, top with onions and tomatoes. Wrap in wax paper, parchment paper or foil to hold it together while eating, serve immediately. The official release date of More Than Poutine: Favourite Foods from My Home and Native Land is 2 October, 2017. UK readers can pre-order through Celebration Generation or Amazon UK. Marie Porter/Celebration Generation has made it possible for me to host a giveaway for my readers in the UK. The winner will receive one copy of the book More Than Poutine. To enter, simply leave a comment below (on this blog post). Anyone with a UK mailing address can enter (the prize can’t be sent to an address outside the UK). The deadline for entries is 8pm (GMT) Sunday, 1 October. The email address provided to leave a comment will not be visible to others. I will contact the winner via email at which time their UK mailing address will be requested. The winner’s details will be passed on to the publisher who will post the book directly. Good luck! I received a review copy of More Than Poutine from publisher Celebration Generation. Recipe reproduced with permission from Marie Porter. This entry was posted in Our Kitchen and tagged Canada, Canadian cooking, Celebration Generation, donair, Favourite Foods from My Home and Native Land, gluten free, Halifax, Marie Porter, More Than Poutine, Nova Scotia, poutine, vegan donair meat, vegetarian donair by One Two Culinary Stew. Bookmark the permalink. That sweet sauce for the donair sounds really good! Really interesting book – love to know more about the variety of heritage dishes and their origins. There is so much to know! Canada is such a diverse country. It’s so hard to find the right cheese curds in the UK. It’s the key to a good poutine. I’ll be honest, as a Nova Scotia I’ve eaten my share of donairs. They are delicious, no doubt. Sadly, the original area in Halifax where the donairs originated is nearly gone. However, I will say that they are eaten by most people after a night our! As a lifelong foodie I feel ashamed I have little to no knowledge of Canadian cuisine, though I can imagine there are endless (delicious) influences at play! I’d absolutely relish a chance to explore this and match it up with Canada’s rich and diverse heritage! There is so much to know about Canadian cuisine. Even Canadians don’t know it all 🙂 It’s so varied and interesting. This looks like such an interesting book. I’m not Canadian, but having had a few Canadian friends I’ve got a glimpse of the cuisine with Poutine & Nanaimo Bars (my fave!). Would love to learn more! This cookbook is such a great resource for knowing more about Canadian cuisine.